Scooter Braun has signed on to take charge of the R&B star's career, adding the Yeah! hitmaker to a stable of artists that also includes Bieber, Kanye West, Tori Kelly, and Carly Rae Jepsen. Sources tell Billboard Braun has also signed rising Roc Nation rapper Vic Mensa to his management company. The news comes just four months after Braun and former client Ariana Grande parted ways in February (16). Usher was coy about the management deal when asked to comment on the industry news at the 73rd annual Cannes Lions on Tuesday (21Jun16), telling reporters, "I've always been in the Scooter family. We actually have worked together on artists, and worked together in business. So it’s just a continuum." 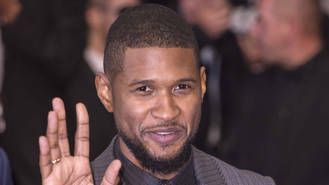 Usher recently revealed he was excited to release his eighth album, Flawed, later this year, although he couldn't provide fans with an exact date. "You know, I like to release music the way I feel it, as opposed to having a date," he explained. "The idea of dates, boxes, categories are very scary for me." The 37-year-old hasn't released a record since 2012's Looking 4 Myself, but he has been steadily working on his new album whenever he's had moments of inspiration. "I find the inspiration every time I find a word: what is 'flawed?' It's something that is not perfect," he continued. "It's a future relic of some sorts, to grow and blossom and gain texture. But it is those things, those tumultuous occurrences and things that happen in your life that define what it is, and in our country and us as people. All of these things are standards, and I became the inspiration. Now I can't tell you yet at the end what it's gonna be, but right now it's Flawed."